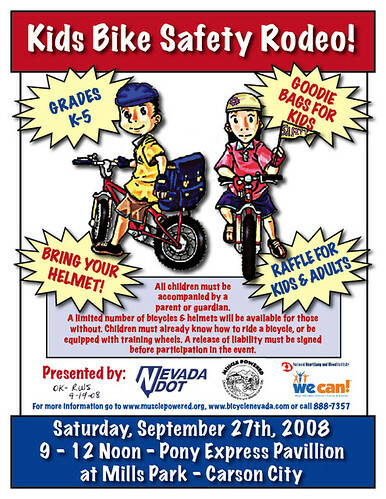 This coming Saturday, September 27th, is the Kids Bike Safety Rodeo. The event will be held from 9AM – Noon at Mills Park in the Pony Express Pavilion. Bring the kids down (Grades K-5) for bicycle safety inspection, helmet fit, and skills training! We have a few volunteers for the Rodeo, but are looking for a few more for miscellaneous tasks. If there is anyone with basic bicycle mechanic skills, we need help in this area too. We are also in need of refreshments (water and coffee would be nice) and prizes for the raffle, if anyone has any good connections in this area! Send me an email (address on the contact page) or make a comment here if you’d like to help. Coffee will be available courtesy of Starbucks. Previous Previous post: Pint Night?